A multi-tier structure of locations will define upstream and downstream servers in your corporate network. Locations without a parent are the so called top-tier locations. Their servers connect to the midgress servers of the IBM Cloud Video CDN. When you set a location as a parent for other locations, the servers of this parent location will become the upstream servers for the child locations. Instead of downloading content from the IBM Cloud Video CDN midgress servers, they will request it from another ECDN server within the corporate network. A location can have only one parent, but can have multiple children. Maximum 3 tiers are supported. There are various methods to define parent-child relationships. It will depend on your workflow which one you will prefer. You can set the parent when you edit details of a new or an existing location. In the location list, you can add a child to a location. In the location list, you can set the same parent for multiple locations at once. Create a new location from scratch by selecting the Add new location button at the location list. In this scenario, you will set the parent location on the Add new location page. Choose the option of “Selected location” (1) on the Set parent… dialog and select a location from the list (2). When you have selected the parent, its external IP addresses and prefixes will be inherited by default (1). You can also choose the option to set a custom value (3). The field of external IP addresses will be cleared and you can enter a new value (4) (or copy from another location). You can change the parent for existing locations on their Edit location screen. When you set the new parent, it will keep previous custom external IP address values by default. However, you can still change it (enter new custom values or select “Inherit values from parent”). Clicking the Save button will take you to the Confirm location updates page where you need to review the changes and confirm the update. At the list of locations, you can easily add a new location as a child of an existing one. Click the “+” icon that appears when you move your cursor over the selected location in the list. This will open the Add new location page where the above selected location will be already set as parent. When you select one or more locations in the list of locations, the Set parent button will be enabled and you can start the process of changing their parent at once. All selected locations will be moved to the same level, regardless their previous role in the hierarchy. If the selected locations have children and you intend to keep their relations to their original parent, make sure that you haven’t marked them to get the new parent. The Set new parent… dialog will open, where you can select the new parent. Choose the option “Selected location”. Clicking the Review changes button will take you to the Confirm location updates page. Changing parent-child relations will assign new upstream servers to the servers at the involved locations. 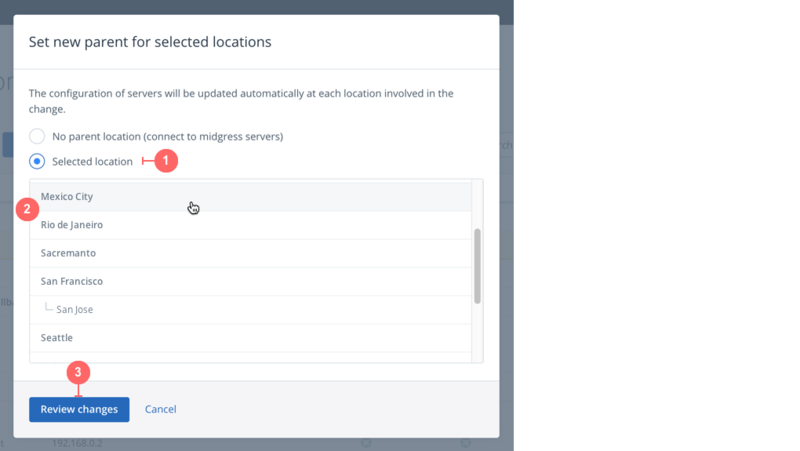 This step in the process will let you review the changes before you commit to configure the servers remotely. The changes will take effect after you confirm the updates.